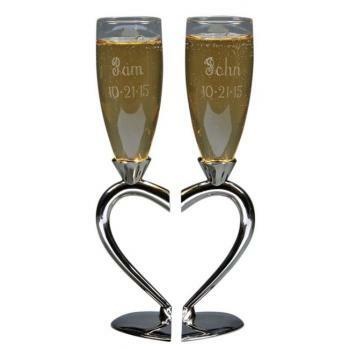 Your hearts cannot be split, that is until it is time to raise a toast on your wedding day with our non-tarnish silver and glass toasting flutes. The split heart base is lacquered non-tarnish silver plate and the flute holds 6 oz of champagne. These flutes stand 10.5" H. Not only are they beautiful to behold but are fun too. Gift boxed.